Michael Knight (David Hasselhoff) fights crime with the help of KITT, an artificially intelligent computer coupled to a virtually indestructible supercar, usually saving a damsel in distress or two along the way. Or, as creator Glen A Larson once described it, “The Lone Ranger with a car”. 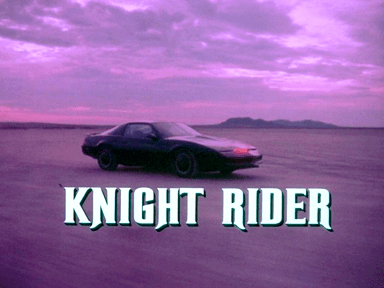 Topped and tailed with shots of KITT driving through a purple-hued desert landscape, the intro features clips of the show’s stars (Hasselhoff, Edward Mulhare and Patricia McPherson) and action sequences from the show with shots of KITT’s exterior (a customised 1982 Pontiac Trans-Am) and futuristic-looking interior. The heavily electronic theme tune was composed by Stu Phillips, whose work also includes the opening music for The Six Million Dollar Man, Buck Rogers in the 25th Century and the original Battlestar Galactica. He also produced songs for a variety of recording artists, including Nina Simone. Basehart’s voiceover was the final piece of the puzzle. Without it, the original intro was merely very good; with it, it became iconic. Knight Rider’s intro was revised slightly each season with new visual clips, although Phillips’ theme music remained essentially unchanged. Below are the original intro and the one used in season three. Note the lack of narration, and the absence of a credit for McPherson. And for a comparison of how it is possible to take a classic original and turn it into a completely soulless mess, here are the opening titles used during the first half of the first – and only – season of the 2008 reboot of the show. Posted in Classic TV intros, Entertainment, TV & film and tagged classic TV, cult TV, David Hasselhoff, Edward Mulhare, intros, KITT, Knight Rider, Michael Knight, Patricia McPherson, Stu Phillips, themes, TV. Bookmark the permalink. The Hoff! You can’t beat The Hoff! I may be giving away my age here, but I can remember very well Edward Mulhare starring in a TV series called The Ghost and Mrs. Muir. Do you remember that one? Great post Tim, I would love to do something similar on my blog but don’t want to nick your idea! I loved Knight Rider when I was a kid but also really enjoyed Street Hawk. It is very eighties but is still quite exciting to watch. Ok Tim, I might well do that. I remember loving Street Hawk as a kid but when I saw it a few years back it was very disappointing but the theme tune is classic. I am going to have to have a think about which ones to choose but it will be interesting to see if there is many overlaps. Whatever happened to the classic TV intro?